Inside The Cure for Divorce by Michael Sayen, there is a ton of research and explanation about what the Bible defines as marriage and says about divorce. It is so well researched that it could almost be a Bible commentary book on its own about this specific subject. Sayen takes us chronologically through the Bible, starting with an explanation of what a covenant is to showing us everything that is taught about divorce. The journey goes from studying the laws set forth in Deuteronomy, to the Gospels of Matthew, Mark, and Luke, to Romans and finally Corinthians to give us answers about what God wants for marriage and says about divorce. The book is well formatted and the research is documented and referenced if the reader wants to refer to the original source for more information. The Cure For Divorce, as Sayen sees it, is staying true to the Bible and God’s will and not conforming to this world. This short read is not short on content and very strongly and succinctly provides the biblical view on the subject of marriage and divorce. 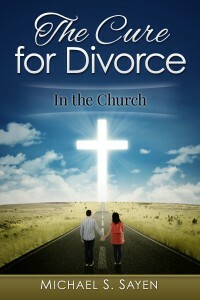 The title of the book is actually clever because a casual reader might pick up the book thinking it’s a book about marriage counseling and how to save a bad marriage; in fact it is about God’s will for marriage and will in fact save a marriage if applied and understood that divorce, for God, is rarely an option. Chapter 1: A marriage covenant was designed to be for “life!” It’s a covenant, not a contract. We who are now saved are in the covenant of Abraham and his Seed (children of the free woman). The Mosaic Covenant has become obsolete and vanishing away (children of the bond woman). God will restore His Bride Israel in the last days. Chapter 2: We know originally neither man nor woman was allowed to divorce their spouse “in the beginning” Matt. 19:8. Chapter 3: Because of man’s heart growing hard against his unfaithful wife Moses gave him “permission” for a Writ of Divorcement (Deuteronomy 24:1). Moses only allowed the man permission to divorce his spouse because he understood the husband’s authority over his wife Gen. 3:16. Chapter 4: Jesus made it clear that a marriage covenant is not abolished until it is done according to God’s guidelines in Scripture; otherwise, it says if you marry again you will be committing adultery “against” your former spouse Mark 10:11. Chapter 5: Defining what Paul meant by the “law of the husband” and what it means to the woman in the marriage. Chapter 6: Paul made it clear that a Christian man/woman is charged (commanded) by our Lord Jesus not to separate or leave the marriage 1 Cor. 7:10-11. Paul says that man should not even “seek” it (1 Cor. 7:27). Chapter 7: To strive to be perfect as your Father in heaven is perfect, to love your neighbor as yourself, and return back to God’s design of marriage as in the beginning.